The course is designed for anyone who wishes to understand the mechanics and operational workings of their digital camera, be introduced to basic image management techniques using the latest digital editing software, and learn more about photography in a relaxed and creative environment. -During the course, students will be exposed to a wide range of photographers work via periodic slide shows, and have their own work analyzed during critique sessions. This part time course on black and white film photography provides part time students with the technical skills to operate a film camera, develop their own film and process photographs. 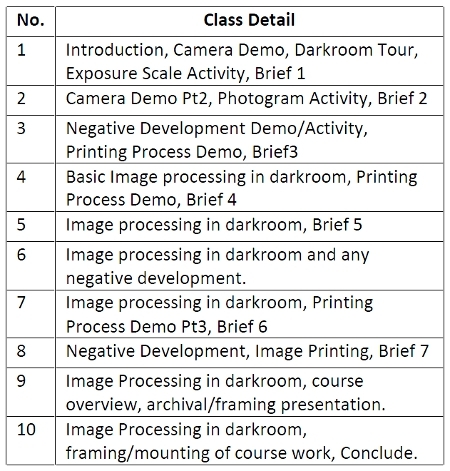 The focal point of the course is concerned with the individual development of photographic style through an interactive method of learning about the film camera, the negative, and how to develop photographs inside the darkroom. This course is aimed at persons who have a keen interest in learning the technical ability of manually operating a film camera, a sound knowledge of darkroom processes as well as a basic history of film photography. Presentations, demo’s and project briefings are facilitated to part time students over a period of 10 classes. Each brief correlates to the theory of that particular class and provides the part time student with an opportunity for creative flair and technical growth. Demo’s and presentations are also met with weekly handouts of reading material regarding the practical brief for that week. Students will be provided with a list of basic supplies needed for the course before the first class.